A budget chain hotel that's a cut above the norm because of its choice location opposite Christ Church Cathedral, giving some rooms lovely views. Staff are also friendly and welcoming, and prices can be very affordable, particularly considering the location, within walking distance of all the main sights, and the fact that all rooms can accommodate three adults or two adults and two children. YOU SHOULD KNOW While the hotel offers parking, it's at a cost - a 50% discount on the public car park nearby. The big but somewhat spartan rooms are decorated in bright colors and have utilitarian furniture. The windows are triple glazed to keep the noise out, and beds are comfortable, with options for hard or soft pillows and feather quilts. Ask for a room at the front for a view over the cathedral. Bathrooms are also a reasonable size, with small white tiles and Gilchrist & Soames toiletries. Most have showers over baths. The lobby has a pretty standard, slightly corporate feel, but staff are competent. 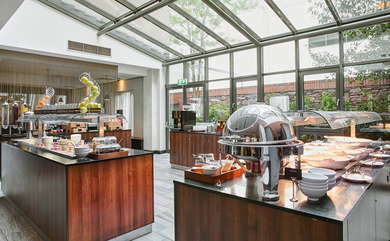 The Kitchen restaurant offers standard hotel-style dishes - salads, pizzas, burgers - and a reasonable breakfast that's not always included in the rate. It has a pleasant outlook onto a planted garden. The hotel's restaurant is family-friendly, with filling choices, a relaxed feel and an affordable kid's menu that also has puzzles and facts on it to keep the little ones entertained. The hotel bar, with its purple and black chairs, is a bit more inspiring than the average hotel chain bar in part because of its outlook onto the cathedral through floor-to-ceiling windows. It has Costa coffee in the day and a reasonable selection of alcoholic drinks at night. The hotel is very central, meaning that almost all of the main sights are within an easy stroll. Hotel staff can advise guests on public transport options nearby too. Try the fish and chips at the 100-year old traditional chippie, Leo Burdock (1-minute walk). Or go a little more upscale at Toscana (2-minute walk), a pleasant Italian where as many of the ingredients as possible come from the owner's family farm in Co Wicklow. Try the Guinness at classic old city-center pub, Grogans (9-minute walk), which has local artists' work hanging on the walls. Or drink in the company of history at Ireland's oldest pub, The Brazen Head (6-minute walk), once a meeting place for revolutionaries as well as author James Joyce and now a great, lively traditional boozer. Reliable and comfortable, the Jurys Inn Christchurch won't set your world on fire - or your wallet, which is a key part of its appeal. Good for families and well-located, with some nice views.